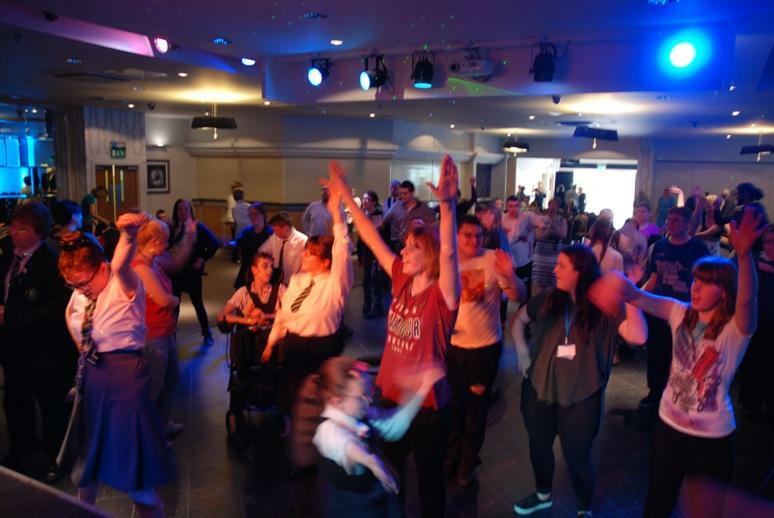 There was much joy in the Woodland Suite at Ribby Hall Village on Friday 6th May when over 100 children from three local Special Schools took part in the 23rd Annual Special Schools Music Festival. The Festival is organised by the Trustees of the Superintendent Gerald Richardson Memorial Youth Trust, and gives the children the opportunity to participate in a great Festival of Music and Dance and show off their talents. Unfortunately this year, Great Arley School, Woodlands School and Pear Tree Specialist School were unable to attend. The Trustees look forward to welcoming them back next year. Greeting the children on arrival were Radio Wave’s two wonderful characters Chuck and Charlie. The stars of the show were the wonderful pupils from the schools. Red Marsh Special School students were in fine voice performing classics ‘Lean on Me’, ‘History’ and finishing with a rousing rendition of ‘Dancing Queen’, thrilling the audience. Park Community Academy, students never fail to please. Their singers and dancers performed ‘Rule the World’, ‘Price’ and ‘Tag’ followed by two great girl soloists. As always, their band raised the roof and played some lively tunes inspiring the audience to join in clapping and waving. There was also be a Guest Appearance from young people at My Life based in Standish Wigan, who provide education and worked based learning with individuals of all ages and abilities. Their contribution was called My Voice. My Life – an inspirational compilation of music and dance. All the young performers were a great credit to their schools, parents and support staff. The Festival was free to attend and commenced at noon lasting for about 2 hours. It is without doubt an inspirational event. Rotary & Blackpool Town Crier Barry McQueen kicked off the proceedings playing the Post Horn Gallop which thrilled the children. He also did his cry ‘Oyez’, each time the children responding loudly echoing ‘Oyez’. The Trustees are grateful to the Harrison Family and Directors of Ribby Hall for providing such splendid facilities. Harry Ramsden’s very kindly provided a ‘goody bag’ for every child. Rotary District 1190 (Lancashire & Cumbria) Assistant District Governor Cyril Wildon and his wife Carol, representing the District Governor who was incapacitated. Mrs Maureen Richardson, Gerry’s widow who is a Trustee as be in attendance. The Gerry Richardson Trust was set up in 1974 in memory of Gerry by his colleagues in Blackpool North Rotary Club.Gerry was a passionate supporter of young people and the Trust assist many young people ensuring that Gerry’s legacy lives on. Gerry was a Superintendent in Lancashire Constabulary based in Blackpool. On the 23rd August 1971 Gerry was shot and killed by armed robbers following a raid at a jewellers shop in Blackpool Town Centre.